Following the crucifixion and death of Christ, Peter seemed lost. So much had taken place in the three years since he had first encountered Jesus. At the beginning of their ministry, Peter was bold, but his assertiveness often proved to be a hindrance to his maturing in faith. Following the death of his Master, Peter seemed to be a shell of the once confident disciple he became known as. Yet, even with the foreknowledge of all this, the Lord chose Peter to be the rock on which the church would be built. We all have our shortcomings. Even with the best of intentions, Christians can charge head first into a ministry opportunity with the boldness of Peter but things just don’t seem to work out. There are even those instances when we fail to recognize the beggar, turn away the poor, or simply ignore the aged one in the nursing home. When we disregard them, we, like Peter, deny our Lord Jesus. Peter wasn’t perfect and neither are we. Called to be disciples, we often stumble and must rely on God’s grace. Our Lord asks but one question; Do you love me? These words reach us at the center of our being. Of course, we love Jesus. 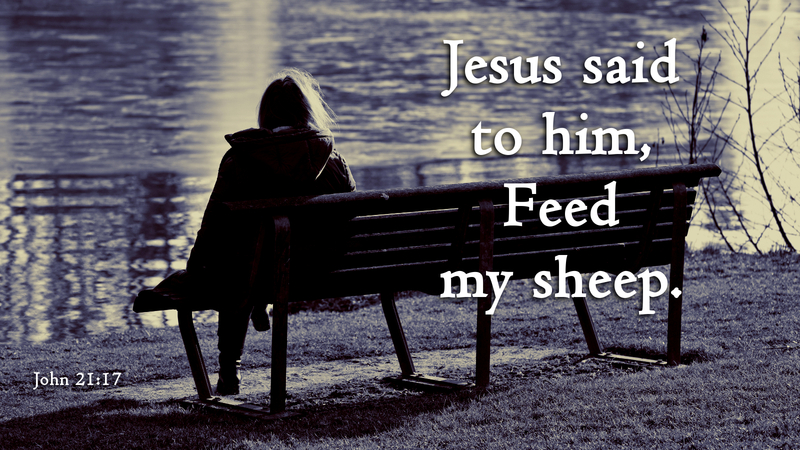 And so the Lord says to his people, Feed my sheep. Prayer: I love you Lord Jesus, and long to do your will. Amen. This entry was posted in Discipleship, Easter and tagged Disciple, Discipleship, Easter, Grace, Jesus Christ, Kingdom of God, Love your neighbor, Salvation, Servant, Spirituality, Teaching of Jesus. Bookmark the permalink.